My friend uploaded this photo on her FB. Bus express accident at somewhere of highway, and just now. My friend posted she was ok. Thank you. How on earth a bus express can derail off track the highway ! 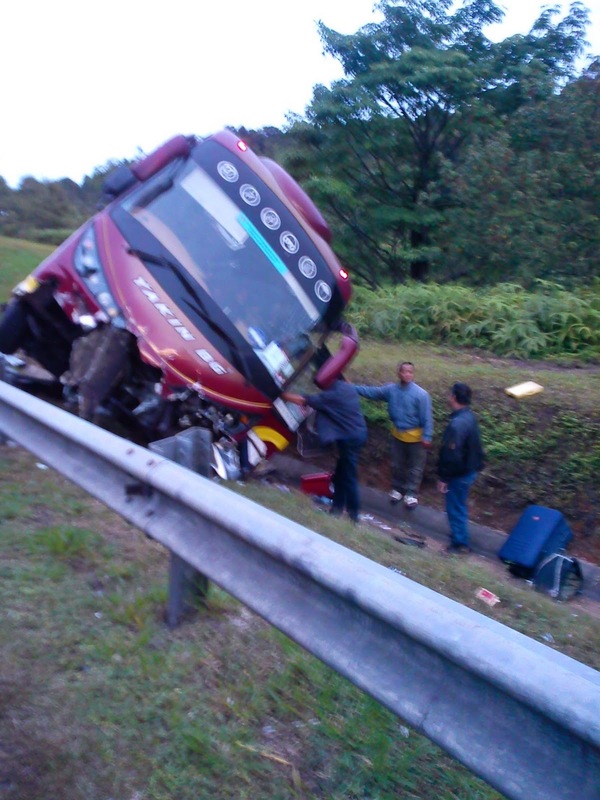 This recalled my own experience with bus express when im back to KL from Butterworth 2 years ago. I was sitting in front, was enjoying my sleep, and i know the bus is entering the tunnel and going to downhill toward Ipoh. 1 brake, have sound, 2nd brake have sound, not it's not breaking, not slowing down the bus, and 3rd time, i heard the bus driver sound "NO BREAK" ! im quickly opened my eye and i can see the bus is heading downhill without break! Worse, there's a traffic jam in front! The bus is crashing right and left... and im at the back of driver shouting whenever the bus crashed the cars in front !!! I lost count how many cars the bus crashed, and some of the car being hit and dropped into the drainage! How the bus would be stopped! There's a van become the victim. The bus vertical T-bone crashing the van, and dragged dont know so how far and its stopping the bus. I was in shock. Hot date on New Year Eve? Yes! JUNGFRAU: THE WORLD'S MOST GORGEOUS MARATHON? Cycling. Eating. Companion. = Great Weekend.